« Day 321 – Sandra M.
Day 322 – Margo R.
Today I’m going to take you where many people loathe to go. That’s right, the dentist office. Now I have been going to a great little dental practice up in Bethesda for many years: Dr. Juan Loza. But they don’t accept my new insurance so I started looking for a new one. We have a wiki site at work and I found some good comments about Dr. Margo Robinson at Watergate Dental, so I decided to make an appointment. It’s very much like any other dentist office, with the exception of the hallway that is full of photographs of notable people (I guess they’re notable, I didn’t stop to check any of them out) who presumably have been there for dental work. I plopped down in one of those reclining chairs and the dental hygienist started cleaning my teeth. I guess my teeth were ok…she didn’t find any major issues. Then Dr. Robinson came in and took a look. I was thinking that if I gave her $10 maybe she would say I didn’t have any cavities. She did say that I have some “notching” or recessed areas on parts of my gum line though. Dentists have been telling me this since I was in my early 20s. She gave me a mirror and pointed out several places where the gum no longer covers the lower part of the tooth. “The good thing is that the root is not exposed,” she told me. However, if they keep receding she advised me to get some bonding done on top of that to protect the area. I asked her for some dental advice for you guys. “Prevention is key; regular cleaning. The biggest issues usually stem from patients ignoring problems.” She also spoke very highly of conscious sedation. “It helps patients with oral disease cope with their fears.” Conscious sedation, she explained, is where the patient is in a state where they can respond to verbal directions, but he or she feels little to no pain. I think she said they don’t remember anything either. Freaky! She wasn’t sure what she was going to do with the ten dollars. I emailed her yesterday and she told me that she gave it to a street musician who plays the trumpet near the Courthouse Metro stop in Arlington. In fact, she told me in her email that she has been giving much more to Street Sense vendors and other homeless since learning about the Year of Giving. 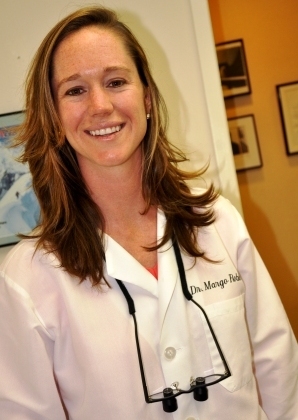 When Dr. Robinson is not helping people keep their teeth in their mouths and have beautiful smiles, she enjoys running, biking, swimming, skiing and golf. She’s pretty active. She even told me that she was supposed to run the Marine Corps Marathon the previous day, however an injury interfered with that. It didn’t hold her back too much though, she still ran in 10K event that’s held along side the marathon! Way to go Dr. Robinson! I got my complimentary tooth-brush and floss and was on my way. Okay – after the pic’ of your teeth I had to reconsider why I am following your blog Reed. No offense – I stopped reading at that point – I suppose you are doing a public service or something, but um…. Anyway…I will be back. Just no more teeth dude – and please, don’t go in for a ….well, oh – a prostate exam anytime soon. Wait. ‘Watergate’ Dental? Are you sure she did not ‘bug’ your mouth?